Three years ago Brad Dirkman of Underwood led the Leech Lake Walleye Tournament after the first day, but only weighed three small fish on the second day and fell to 10th place. He was in the same position after day one Friday night of Cabela’s National Walleye Tour on Leech Lake. This time Dirkman decided to play it safe on day two and it worked, as his total of 25.93 pounds won the pro-event and earned himself $63,127 in cash, bonuses and a new Ranger BMT boat and trailer. Dirkman fished the first day on Walker Bay and did well with five walleyes weighing 18.35 pounds; and on the second day he weighed in five more for 8.48 pounds. Under tournament rules, pros and co-anglers can keep two fish over 26 inches per day, and the other three must be between 15 and under 20 inches. Tommy Skarlis, a former Walker resident, finished the pro-event in second place with a cumulative total of 25.93 pounds. Amazingly, he achieved that weight despite catching only seven keeper walleyes over the two days. On day one, he managed only two fish, but they weighed 13.92 pounds. The second day he put a 12.01-pound limit in his live well — rising from fifth — to earn $23,628 with boat and motor bonuses. The second-heaviest limit of the day belonged to longtime Nisswa guide Richie Boggs. After catching 8.53 pounds on day one, the veteran pro sacked a whopping 17.16-pound stringer and rose to third with a total weight of 25.69 pounds. Rounding out the top five are Cabela’s pro Kevin McQuoid and Ohio pro Mark Brumbaugh. McQuoid started the day in third place with a solid slot program and slipped to fourth after catching a 9.87-pound limit. Like many others, McQuoid fished Walker Bay for his overs and had a milk run of spots for his slot fish. His cumulative total was 25.66 pounds, a weight that was achieved with just one over. If not for a .50-pound penalty for an expired fish, McQuoid would have finished second. Mark Christianson of Walker was sitting in second place after day one with a 16.52-pound basket, but fell to 17th place after only bringing in two fish on day two for a total of 19.84 pounds, which did earn him $4,872 in cash. Laporte angler Jay Carroll was crowned co-angler champion after catching 10 walleyes over two days weighing 32.12 pounds. This was Carroll’s first time ever cashing a check in a tournament and it was a big one at $6,926. His 19.94-pound day-two stringer was the heaviest of the tournament. Finishing second in the co-angler was Cal Clausen of Veradale, Wash., with a two-day total of 30.11, which was good enough for $3,701 payday. John Hoyer of Orono took third with 24.72 pounds and won $2,611. 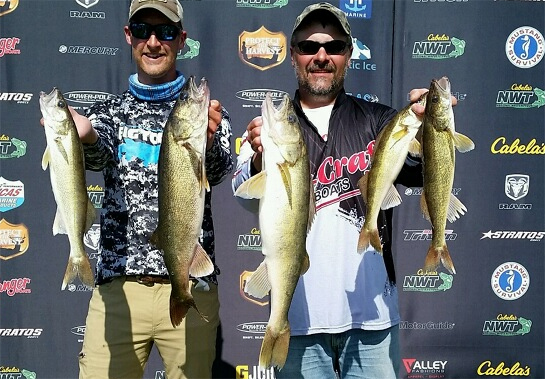 The third qualifier of the 2015 Cabela’s National Walleye Tour season is slated for July 24-25 on Lake Michigan’s Green Bay in Green Bay, Wis.
Information provided by Brett Carlson, courtesy of Cabela’s National Walleye Tour.